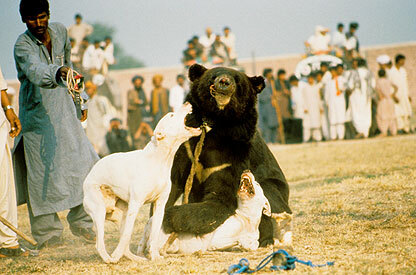 Despite being banned by the Pakistan Wildlife Act, bear baiting, one of the most savage blood sports still in existence in the world today, continues to take place in rural Pakistan. 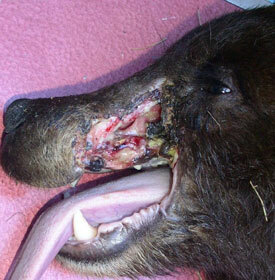 There are thought to be around 70 bears still subjected to these attacks. The bears are tethered to posts, often having had their teeth and claws removed so they have little means of defence and they are then set upon by trained fighting dogs. The attacks can take place up to six times a day without the bear having any of its injuries treated. Across Asia, thousands of bears live a life of torture on bear farms. They are confined in cages, varying from agonisingly tiny ‘crush’ cages to larger cages, enduring dreadful physical and mental suffering every day for years and decades on end. The bears have an opening carved into their abdomens so that they can be ‘milked’ for their bile up to twice a day – an excruciating process for the bear. The bile is then used to make medicine, shampoo and even toothpaste despite herbal and synthetic alternatives existing. The bears often sustain self inflicted injuries through desperate but always futile attempts to free themselves. Dancing bears have been eradicated in Greece, Turkey and Bulgaria but unfortunately they still exist in India, Pakistan and Nepal. 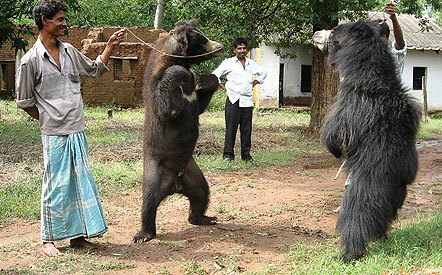 Bears used for ‘dancing’ endure a lifetime of physical and mental distress. Many people are unaware of the cruelty behind the spectacle. A bear cub is often caught after its mother has been shot. The bear then has a ring forced through its nose and a rope is pulled through a hole in its upper palate. Tugging on the rope causes the bear great pain. The bears are then beaten on the legs and buttocks while music plays, they then associate pain with music and therefore ‘dance’ in anticipation of pain. Hundreds of bear cubs are left orphaned every year as a result of legal and illegal hunting. If these cubs were left in the wild, they would most certainly die. Adult bears also suffer terribly through hunting ‘Jaws’ (left) being one of them. Shot in the face, he was brought to the Idaho Black Bear Rehabilitation Centre and was painstakingly nursed back to health undergoing much reconstructive surgery, to be returned to the wild a fit and healthy bear. The amazing work of rehabilitation projects around the world, prove that often injured and orphaned bears can successfully be returned to the wild for a second chance at life.